Not content with charting the little known jetties and beaches of Port Philip Bay the Aquability Saturday Shore Divers (extreme) answered the call from Ra Divers in Western Fiji to find them a new dive site. Skipper Ceci and his dive crew were getting tired of their standard dive sites like “Wheat Fields” with its masses of waving yellow grasses atop of its coral head or ” Instant Replay” with its current driven ride around the end of the reef and back over for another run. They had heard that ASSD was the team to call. Vikki and Mark Robinson put together their team of crack extreme divers and led them to the expedition base at Voli Voli accompanied by their support team. We pushed off early at 9.00 hours after carbo-loading with eggs, bacon and pancakes. Skipper Ceci under command of Commodore Mark Ryanarama headed off on a NNW setting pushed along by two 300 horsepower Suzukis we made quick time to the drop zone. Vikki was now in control navigating by women’s intuition and a iPhone. She lifted her head and shook out her hair and dipped her hand into the water to get the vibe, as we drew closer to the undiscovered dive site. “Here” she said and called for the anchor to be dropped. Our skipper was appointed the scout diver. He donned his specialized, extreme diving gear consisting of a tank in a dive bag and leapt overboard. Commodore Mark took control of the boat for the final adjustments. Back in board Ceci said “Its good there are soft corals, hard corals, gorgonian fans, big fish, little fish, there might be a turtle and pelagics and there is current. We will do a multi level dive starting at 20 meters.” The ASSD teams were ready for action in minutes, eager to explore this, as yet, uncharted dive site. Dropping on to the wall we descended to 26 meters only to be hit with current. Being superbly fitness the team quickly pushed past this obstacle to find diving gold. Just around the corner was what Vikki had sensed. There was a collective sigh of shock and awe from the team (which is quite hard to do through a dive mask). 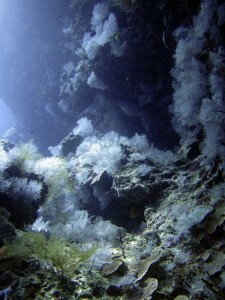 A wonderland of coral-filled swim-throughs, crevasses, slots caves and valleys was before us. 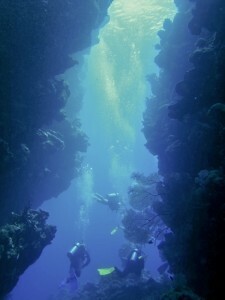 The sun streamed down filling the dive site with joy and the team knelt and gave thanks. After documenting the site with several hundred blurred photos the team returned to the surface swept along by that current. Mission accomplished they were picked up the boat several kilometres away. We returned to Voli Voli on our last day satisfied that we had saved Ra Divers reputation as a fine dive outfit and satisfied that once again the Aquability Saturday Shore Divers had excelled at what they do – extreme diving, any where in the world, done right, on time and with a smile.